The Mayday Roll and Go two person backpack survival kit on wheels is designed to provide you with survival supplies to get through the early stages of an emergency or disaster. 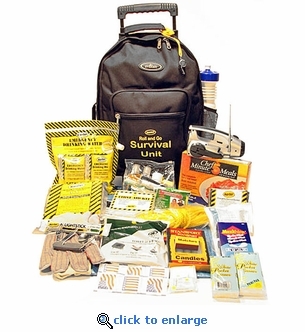 This emergency survival kit has the supplies two adults need for shelter, warmth, hygiene, survival food and water. Backpack emergency kits are great for home, office or your car and can be grabbed quickly if you have to move to a safer place.